From time to time I receive questions about my beauty routine – hair, skin, makeup. And while I have no intention of ever making beauty topics a main focus of PBR, I do think that it’s fun to discuss on occasion! I have always loved playing with makeup. This started back in high school but I will refrain from sharing those pictures with you. Let’s just say that it’s a good thing that white eyeliner and glitter powder are trends of the past. Over the years, one thing that I have never compromised on is my makeup. I learned quickly that I do not like for other people to do my makeup. It just never feels like me, if that makes any sense. I had a makeup trial before my wedding and decided on the spot that I would be doing my own makeup on the big day. Although I do have products that I am loyal to, I also enjoy browsing the makeup aisle and bringing home new products to play with. Recently, I was offered the opportunity to try CoverGirl’s new LashPerfection Mascara. Mascara has always been one of my very favorite makeup products so I immediately responded that I was interested. I have quite a routine for applying mascara. I always start by gently heating an eyelash curler. I curl my lashes twice and then apply two coats of mascara. My lashes are pretty short so I have found that this method makes them look longer and thicker. I’ve been doing this routine since high school! In the past I always splurged for pricy designer brand mascara but recently I have been experimenting with drug store brands due to becoming a little more budget conscious. We have a winner. The LashPerfection Mascara applied beautifully with no clumps or smears and added a lot of length and volume to my lashes. My favorite thing about LashPerfection is definitely the brush. It is unlike any mascara wand that I have ever used (in a very good way!) and it covered every single lash. I will say that I typically prefer a waterproof formula (LashPerfection is not being offered in waterproof at this time) due to the amount of sweating and teaching that I do but after wearing this mascara all day and through teaching a hot yoga class, there was no flaking or running. And I’ve enjoyed being able to wash my mascara off with regular face wash in the evenings. The best part? LashPerfection retails at around $5.99 per tube which I think is a fabulous deal! While we’re on the subject of make-up and looking great, you check out the “Looking Your Best” posts in the Life Well Lived section of BlogHer.com. There are some great application tips and ideas for switching up your look for fall! – This giveaway is open to US Residents age 18 or older. – Contest runs from October 4-November 4, 2011. Winners will be selected via random draw, and will be notified by e-mail. Winner has 72 hours to respond, otherwise a new winner will be selected. Check out the BlogHer Promotions & Prizes page for more reviews and giveaways! Everyday! Just putting on a little mascara and using some chapstick in the morning, without fail, always makes me hold my head a little higher. I guess its a mental thing??! Makeup gave me confidence when I first started dating my husband 16 years ago. Makeup helped me overcome self esteem issues when I was pregnant. While a lot of women feel gorgeous during those 10 months (yes, I said 10), I felt ugly and fat and just out of control. Wearing makeup was something I could do to make me feel pretty and feel a bit better about myself. Makeup gives me the outward confidence that I am putting my best foot forward everyday. If I don’t take the time to put make up on, then I feel like I am letting laziness reign supreme. My boyfriend tells me that I don’t need to wear make up, which should be enough of a confidence booster–but for some reason it’s not enough. It’s a shame that I need to look “superficial” to be confident…. I think the one event where I felt like make up gave me the confidence I needed was at my best friend’s wedding. She means the world to me, and as her maid of honor–I wanted to ensure her special day was the best it could be. can i be honest, those days you wake up, you partied too hard, your face looks like a huge puffball, and you’ve got to go to work. make up to the rescue, and big sunglasses. I’m sure it’s not a dead give away to my boss, but it definitely makes me feel better. Makeup definitely gave me more confidence on my wedding day. I was lucky enough to find someone who did a very minimalist natural look. That was important to both me and my husband to be. I rarely wear make-up as I feel that I don’t have time but I enjoy eyeliner and mascara. I definitely went through that phase where I used glitter eyeshadow and blue eyeshadow. After years of practice and lots of blog video watching I learned how to correctly apply make-up, specifically eyeliner and mascara in order to enhance my eyes. I feel confident now that I don’t look like a dressed up doll and instead for a special occasion I am able to enhance my natural beauty. Makeup and a new outfit gave me confidence on my first job interview post-college! Makeup gives me confidence no matter what the occasion! I am not that great at applying make up, but whenever I have someone else do it for me, I feel so pretty! If I feel like I need a “change” in life, I head to Sephora, or the makeup aisles of Target and pick out some fun new product that I’ve never tried. It’s less drastic than chopping my hair off and less expensive than buying a new wardrobe! if i had to pick ONE thing to apply to my face daily, it’d be mascara. it opens up the eyes and just makes everyone look more awake in general! I also love mascara and wear it almost every day…would love to try this new one or another product! Makeup definitely gave me confidence for my re-entry into the dating world! Not an “important life event” but when I was going on my first few “first dates” after the end of my long-term relationship, I was plenty nervous and having good eye makeup gave me confidence. I rarely wear make-up, but it’s nice when having to go to a work event or more “formal” event w/ people I haven’t met before. My brother’s wedding! It can be stressful to be the unmarried sister of the groom… but it’s a little *less* stressful if you look amazing! i’m a mascara girl myself and have to wear it every. day. since i turned 14, there have been very few days that i’ve not put it on. with blonde lashes, a girl needs a little color. During the week I rarely wear makeup so on the weekends, especially date nights with the hubs, it always adds that extra something! I don’t know the first think about applying my own make up. For my sister in law’s wedding and my own-I felt like a princess. I loved the feeling of being overly confident walking down the aisle!! Even if I’m not feeling great about my body or outfit, as long as I have mascara to make my eyes look great I know I’ll still feel confident. Btw, Maybelline Falsies is the best drug store mascara. And they’re usually on sale buy one get one at rite-aid! Cat-eye style liner is my fave. insta-glam, even more jeans, messy bun & a tee. Helps play up the almond shaped green eyes! I am fair skined so I always like to have a little bronzer on my cheeks. This makes me a feel more confident especially in winter. If I wear nothing else on my face, I try to wear mascara. It makes me look awake and polished! I am not a big make up person but mascara is one I do use almost daily. Under eye concealer has been a saving grace on more than one occasion… hello all nighter before I graduated college! I definitely never felt, or looked better than I did on my wedding day…but I think a little bit of makeup gives me confidence everyday and I love to play with new shades and colors when I’m bored and want to make a less permanent change to the way I look. Makeup gives me a bit of a confidence boost each day. More specifically though, the first three months after having both my children. I still had baby weight and wasn’t wearing all my regular clothes. I was sleep deprived and still a bit uncomfortable in my own skin. But putting makeup on helped give me the confidence that I was still me and helped me feel better about myself. Makeup is wonderful for getting the extra boost of self- confidence and feeling like a girly girl from time to time! Btw, love that wedding pic, you were a gorgeous bride! Lately make up has been my safety blanket! I have had terrible acne from hormones & make up helps me face the day. Makeup always gives me the confidence to head out the door when I feel horrible and just want to stay in bed and sleep. It’s a definite mood booster some days! I rarely wear make-up during the week at work, I feel that it makes time when I wear make-up more special and make me have more confidence! Anytime I am having a bad day or not feeling too great about myself, I always take a few minutes to do my make-up and instantly get a boost of confidence! I have been going crazy trying to find a stellar mascara. Thanks so much for the recommendation!! the last time my makeup gave me an extra boost of confidence was actually when I was peer pressured by my friends to get one of those random makeovers in Macys! My makeup for prom was actually a catastrophe. I was a little heavy handed on the bronzer and didn’t realize until I saw the pictures. The oomph loompa look does NOT work for me! I swear by another mascara but I just had to comment on your wedding photo aww! You made a beautiful bride 🙂 You did a great job doing your makeup! For sure my wedding!! I love makeup and I am into slightly there “glitter” powder. Makes you look sun kissed and lively! Thanks for the fun giveaway! I remember I was so excited when I boy I had a crush on asked me to the prom. I had my friend help me with my makeup because I didn’t have a lot of experience. I felt a lot more confidence that night. I think no matter the occasion, make up is fun to wear and can just make you feel more confident about what you are doing! But I had a great time putting on make up to be a bridesmaid in my friends wedding and helping her with her make up! I’m not a make up person and usually don’t wear any or have very light make ups on. When I attend my husband’s company dinner, I wanted to look my best for him and I put full make up on and I sure felt great and more confidence meeting his colleges for the first time. We both had a wonderful evening at the event. I’ve been wearing makeup since I was 12 years old. Ha, I remember the first day I did too–went to church with bright purple schmear eyeshadow to match my purple and green skirt. :S I’m promise I’ve learned the error of my ways. Makeup is important to me because no matter how crappy I may look (like yesterday, when I wore running capris and a huge sweatshirt to school), as long as I have some eyeliner and mascara to make my eyes pop, I feel pretty. I am not a big makeup person, but getting my makeup done on my wedding day made me feel like a queen. Thanks for the mascara suggestion. I need to get some. A little lipstick always gives me a boost. I really only slap on some eyeliner, mascara and neosporin’s lip therapy and call it a day! Mascara and yellow tinted concealer do absolute wonders for the tired eyes of a student. I’m not the most skilled or adventurous makeup-applier, but I love to watch other people do their own makeup. I often try to copy my sister’s technique, but never comes out looking as good 🙂 Fortunately mascara is pretty fool-proof. I am a makeup girl all the way, if it paid better I would be a make-up artist and do makeup for everyone else! I think wearing makeup everyday gives me what I need to feel great about myself day in and day out. When you look good you feel good, end of story! I love trying new products and switching things up from time to time. What a great giveaway, thanks! I love to play with makeup and try out new products. Lipstick always gives me a boost…my mom was right! make-up, especially mascara always kicks up your appearance. I need to try the curl 2x, mascara 2x trick on my stubby lashes! When DOESN’T makeup give you confidence? Mascara is the 1 thing I can’t leave the house without. Under eye concealer and mascara (I love the wand kind) are two great pick me ups that give me the confidence to approach anything! Makeup gave me the confidence to NAIL a recent job interview – and get the position! Some long, dark lashes and a good lip color can go a long way. I hate wearing sleeveless clothes but when I had to attend a dinner related to work, I felt confident and care free when I had mascara and eyeliner on. It was a great feeling! My wedding! I wear minimal makeup usually, but I had it professionally done that day, and I never felt nervous the entire day! My makeup give me confidence for date nights and going out. Makeup gave me more confidence when I was dating my fiance. He would come pick me up to take me out and I would feel a little better knowing I had makeup on! This October I will be married 10 years. On my wedding day 10 years ago a very helpful and energetic young lady offered to do my makeup for the day. I was fully made with makeup including eyeshadow and blush. I was GEORGEOUS!!! Make-up gave me confidence when interviewing for residency and gives me confidence during my first year as a doctor. I rarely wear makeup. I wear it for occasions like job interviewing when it can really boost my confidence! It’s crazy that I just happened to read this post right now. I’m actually hanging out with my sister and a friend and we’re taking our time getting ready and enjoying a little down time for a big night out in Philly for my 30th birthday! My friend just put some makeup on me (I am so bad at doing it myself) and I feel even more awesome and excited for tonight! Make up always gives me added confidence when I need to be fierce in an important meeting, it makes me feel the part! you are stunning in that picture! 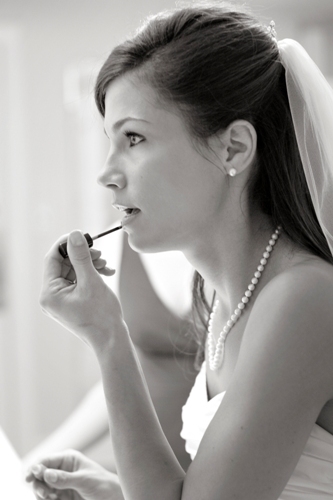 I have to say for me it was my wedding–loved getting my makeup done!! Makeup gave me extra confidence in my wedding day! I had my make-up done for me for my wedding and loved it! It did make me feel really confident and beautiful to have my face look flawless and extra special. makeup gave me the confidence for my last job interview to feel strong! I don’t wear a lot of makeup anymore, but I do put some on if I am going out with hubby or maybe lunching with a friend. I went to my high school reunion recently and boy did it help to wear make up. I think when going on job interviews it gives me added confidence and a more professional look. make up gave me confidence on my wedding day! Makeup gives me confidence when I sing in public. A friend did my make-up on my wedding day and I never felt so confident! I remember getting my makeup done professionally for prom and feeling like a princess! I shy away from a lot of makeup, especially lipstick, but on my wedding day when I was made up to the nines, including lots of lipstick, I never felt more beautiful or confident. I had my makeup professionally done for my wedding and it helped make my day brighter and, since I cried all the way down the isle, I am glad they used waterproof makeup! LOL I knew I would cry a lot during the wedding, so that was one less thing to worry about! Makeup has gotten me through every job interview I’ve ever had! There is something about knowing you look good on the outside, that makes you feel good and confident on the inside! How about for my sister’s wedding – when I was 8 months pregnant and felt like blob? I wear makeup everyday and it always makes me feel polished, confident and pulled together. In my much younger days, in school everyday mostly! After returning to the country from one year in Europe, I had to look for a job. I hadn’t worn make up while overseas but I decided to put on my professional face and head with confidence into those job interviews. I was lucky enough to find a temporary placement that lead to a permanent job in my field. EVERY day of my life, but the biggest impact was on Prom! Makeup gave me confidence when I met my inlaws for the first time.